For a week I might eat salads, or Chinese food, or barely eat dinners. Last night my daughter and I had mini corn dogs. That threw everything for a loop honestly. So I decided I needed to bring this back to the basics and get back into something a little more expected, so let's check out some brutal technical death metal with a dash of grindcore...or something like that. 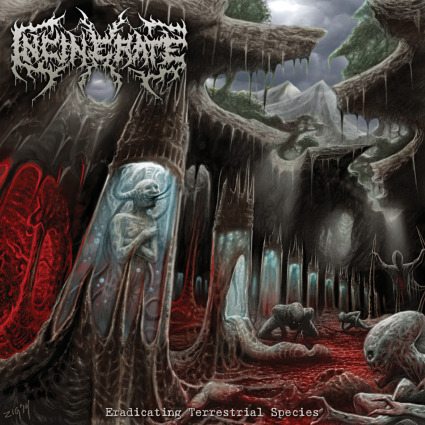 Incinerate is a bit of a transition with their principal songwriter having left the band, but refusing to go away, they've released their latest Eradicating Terrestrial Species and I'm here to tell you all about it. It's easy to tell that we're dealing with a veteran band because their band name only has one word. As this album begins, nothing is held back. It's played at breakneck speeds, with thundering power on the drums, and such nimble riffing on the guitars. It seemed like nothing could come along and sully this spectacular music. After a time, I was drawn into the vocals, but I began to hear them differently. These are not the David Vincent vocals but full on past Cannibal Corpse throats with all of the annunciation of Napalm Death. Where these vocals really caught me was how the syllables flow and bounce in time with the drums and the grooves of the album. This is not going to be the death metal album that finally convinces your stubborn friend, but fans of truly extreme metal will find a lot to like here.